On Wednesday, I told you about an amazing — and quite surprising — treatment for back pain — antibiotics. It wasn't just surprising how well the antibiotics worked, it also was surprising at how well they work. For most of the patients taking antibiotics, they saw at least a 50% reduction in their chronic pain. The reason antibiotics work so well is because so many back injuries become infected with bacteria. However, antibiotics have a problem. As I mentioned, they can have serious side effects. So I would rather you avoid antibiotics for low back pain. But there is a treatment that works even better. I've told you many times before of the remarkable healing and pain relieving effects of Prolozone® therapy. I developed the technique over 20 years ago and have taught thousands of doctors all over the world how to use it to help their patients. Prolozone uses the power of oxygen in the form of ozone, along with other important nutrients, to stimulate the body's innate healing ability. So while Prolozone is a known potent stimulant of the body's healing mechanisms, this new study suggests that another way it might be working is due to its antibacterial effects. Ozone gas is a known potent killer of every bacterium we've tested it on. Ozone is an antibacterial disinfectant for air and water systems throughout the world. And there are many published studies showing it to have powerful antibacterial effects in both animals and humans. Furthermore, unlike antibiotics, bacteria cannot become resistant to ozone. And by the way. Although 65% of the patients in the study had side effects from the antibiotics, there are no side effects from Prolozone treatments. While 50% showed improvement in their back pain from the antibiotics, Prolozone does much better. It completely cures 70-80% of low back pain patients. So if you're looking for a solution to back pain — or any other joint pain for that matter — give Prolozone a try. 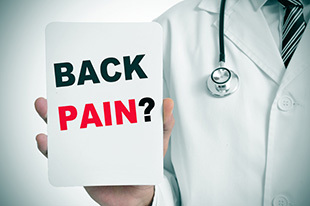 You can learn more about ozone and back pain by going to the "Literature" tab on the web site of the American Academy of Ozonotherapy (www.aaot.us). This tab will give you access to thousands of studies published on ozone therapy, as well as one I published on Prolozone therapy. You also can click on the "Find a Doctor" tab to find doctors trained in Prolozone therapy. As I have reported before, in most cases, Prolozone therapy will relieve back pain better than any surgical or drug therapy without any of the risks — and at a much lower cost.